Amelia County lies south of the James River in the piedmont area of Virginia. As land was taken up in the tide water area, younger sons moved west to settle the piedmont. Between 1735 when Amelia County was formed and 1750 (an arbitrary cutoff date) eight men with the Foster surname settled in Amelia County. This website identifies those eight men and two generations of their descendants. The eight men form two loose clusters of four, one just below the Appomattox River on Stocks Creek in the western part of Amelia County and the other on the waters of Flatt Creek south-east of the first. Of the eight, six lived the remainder of their lives in the county, two moved away. William on Stocks Creek moved to neighboring Prince Edward County and Thomas on Sandy River moved to Rowan County, North Carolina. Where the men came from was of great interest to me but I was only able to discover the origins of one man. Amelia County, with very little record loss, is surrounded by counties that suffered major record loss. The only man whose origins have been discovered is Thomas on Stocks Creek. He was the son of Robert Foster of Essex County, Virginia, and he moved to Caroline County after his father's death. Caroline County has major record losses. William on Stocks Creek bought land from John Hurt of King William County, another county with major record loss. In the Flatt Creek cluster, George Foster married Judith Forrest from Gloucester County and William on Beaver Pond Branch witnessed deeds for John Foster of Gloucester County. Gloucester is another badly burned county. With little success in finding where the men came from I decided to research their children. Many of the second generation remained in the area but others left the county. The six sons of Thomas on Stocks Creek moved to Spartanburg County, South Carolina. Two sons of William on Beaver Pond Branch moved to neighboring Charlotte County. Two sons of George on Flatt Creek moved to neighboring Prince Edward County. The results of this search are given as basic genealogical information: birth, marriage and death. This is given for as many of the second generation as could be found in a reasonable amount of time. Few of the daughters were followed in detail for the same reason. Much of the information given here comes from indirect evidence correlated to form a reasonable conclusion. Sources for the evidence presented are cited and my logic is explained in complex problems. Births in Amelia County would have been recorded in the parish register, but none have survived. Therefore, determining a person's age is very difficult. 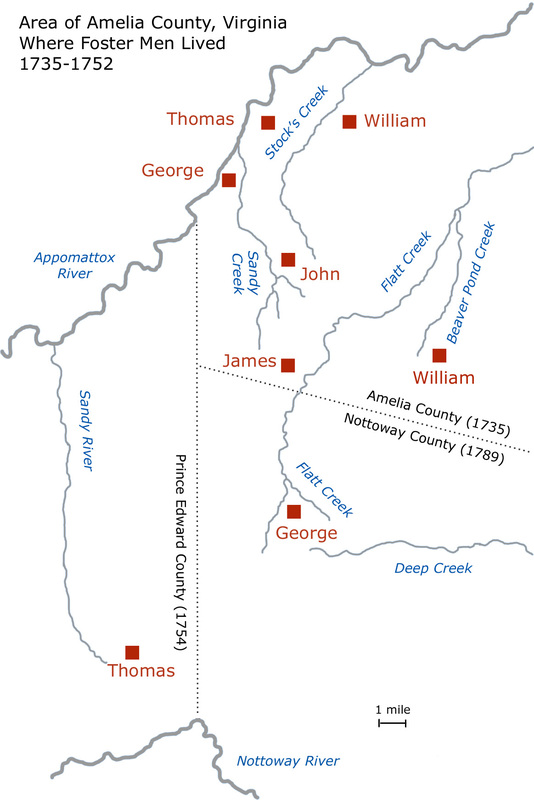 Because Amelia County has an almost complete set of colonial tithe lists, the ages of the sons of the second generation are more easily determined. Men were taxed at 16 years of age so the first year a man was taxed can be used to determine an approximate birth year. If he was first taxed in 1755 he was probably born about 1739. Marriage records would also have been recorded in the parish register. A couple who planned to marry would post banns on the church door and their intent to marry would be read at Sunday services for three consecutive weeks. After three weeks if there was no objection to the marriage, the couple married. A couple could also marry by bond. The groom posted bond that there was no impediment to the marriage. He required surety for the bond and this was often a relative. As with banns, the marriage was recorded in the parish register. So a marriage bond is a record of intent to marry, not a record of the marriage itself. While the parish register has not survived, the marriage bonds, filed in the county clerk's office, have. The Library of Virginia has research notes on early marriages that are helpful. See Early Virginia Marriage Records. Without marriage records, determining the maiden name of a wife can be difficult. Occasionally wills provide evidence. Abraham Forrest named his daughter Mary Foster in his will dated 1757. Thomas James left a will in 1780 that names his daughter Elizabeth, the wife of Robert Foster. John Wright named his daughter Sally and her children Nasy, Orana, William and Stephen Foster. Mary Ellis died without children in 1805 in Rowan County, North Carolina, and her will names her brothers, John, Bradford and William Ellis (establishing her maiden name as Ellis) and her sister Lucy Foster and her nephew Robert Foster. Deeds of gift can be a source for maiden names. Richard Foster gifted land to his daughter Fanny, wife of Austin Nobles, in 1808. Thomas Foster gifted land to his son in-law John Alderson and his wife Keziah in 1783. Land sales by heirs are also helpful. When the heirs of George Foster on Flatt Creek sold land in 1800, the daughters' husbands were named. Chancery (equity) files are an excellent source for maiden names. Naming patterns can be helpful. George Foster on Flatt Creek named his first son Abraham Forrest Foster after his father-in-law. George Foster on Sandy Creek named a son George Pollard Foster after his father-in-law. Sometimes maiden names can be determined by correlating multiple records. See William of George on Stocks Creek for an example. How many times a man married can be difficult or impossible to determine. With high mortality rates, men and women often married more than once. Occasionally wills distinguish between children born of different mothers. George Foster of George on Flatt Creek made that distinction in his will. Richard Foster, grandson of William on Stocks Creek, married four times according to Landrum's history of Spartanburg County but I have only found a reference for one wife. Deaths would have been recorded in the parish register which does not survive and there are very few alternative sources to find death dates. There are no tombstones and deaths weren't recorded in the newspaper. James, son of James on Coopers Branch is an exception. He served as a captain in the Revolutionary War and died in service. His death was recorded in the Virginia Gazette. Most men left estates to be settled and probate records give an approximate year of death. An estate was usually administered soon after a person's death but not always. Often the estate wasn't finally settled until after the death of the widow and probate records will give an estimate of when the widow died. Occasionally a chancery file will give the month of death but usually just the year. Tax lists can also be helpful in estimating when a man died. Identity is a common problem in genealogical research and not just for men with a common name. The colonial tax lists for Amelia County are a valuable resource for this problem. The tax commissioner usually distinguished between men with the same name, often by the waterway they lived on, by their occupation, by the name of their father or by another identifier. But tax lists alone are not enough to create the unique identity needed to distinguish one man from another. Two Robert Fosters lived in Amelia County about the same time, were about the same age and both had wives named Elizabeth. When men left the county and moved west, how are they identified as the same man when the name is a common one? Creating a unique identity requires research over a broad range of records. Thomas Foster who married Lucy and left Amelia County with his brother James was a problem I thought I would never solve. Serendipity solved it for me when I was reading an article in the Magazine of Virginia Genealogy on migrations from Virginia to North Carolina. A Thomas Foster had purchased land in Rowan County, North Carolina, from a man in Halifax County, Virginia. That could have been any Thomas Foster, except that the land was adjacent William Giles. The Thomas Foster who left Amelia County had his improvements of his land appraised by a William Giles. Further research identified them as the same men. William Foster on Stocks Creek is another example. He left the county in 1770 at an advanced age, with a wife Sebrina. How to find him in a multitude of records? Wives rarely appear in records and William Foster is a common name. Deeds in neighboring Prince Edward County held the solution. When William bought land in Prince Edward County, the deed identified William as being of Amelia County and the timing matched the sale of his land in Amelia County. Yes, it pays to search neighboring county records. A county history identified several of the sons of Thomas Foster on Stocks Creek as being of Amelia County. Research in Spartanburg County, South Carolina, turned up other sons of Thomas as well as neighbors from Amelia County. An unusual name can be helpful. Obediah Wingo was the step-son of John Foster of William on Stocks Creek. His association with a John Foster in Spartanburg County led to John's identification as the same man. Pascal Foster witnessed deeds for John Foster in Nottoway County (formed from Amelia County in 1789) and was an heir to John Foster in Barren County, Kentucky in 1825. That led to the identity of John of Nottoway and Barren Counties. Distinguishing between men of the same name requires a broad search that includes identifying their siblings, their in-laws, their neighbors and others they associated with. Without adequate research two or even three men may be confused as only one individual. Occasionally the reverse happens. Two men who appear to be separate individuals are found to be the same man when adequate research is achieved. Amelia County records show five different Foster names from 1735 to 1750 but research across wills, marriage bonds, deeds, land grants, order books, chancery files and tax records reveals eight men, six of whom share a common name. Laurie McKenna. Contact me at foster1735@gmail.com.